Since October 2001, about 1.6 million U.S. troops have deployed to the wars in Iraq and Afghanistan, with many exposed to prolonged periods of combat-related stress or traumatic events. 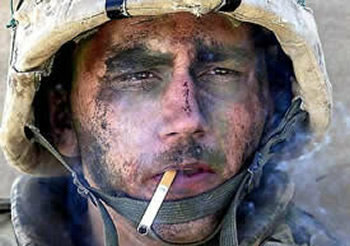 One in five Iraq and Afghanistan Veterans Suffer from PTSD or Major Depression Rates of PTSD. In 2009, more than twice as many U.S. servicemen and women committed suicide than were killed in combat in Iraq (334 and 149, respectively). Women, Hispanics and enlisted personnel all were more likely to report symptoms of PTSD and major depressions. There has been a steady increase in the veterans’ suicide rate since 2001, and a comparatively high rate among veterans ages 20 to 24. The suicide rate for those veterans was anywhere from two to 7.5 times the rate among the general population. The Pentagon estimates that currently 234,000 families have a mother of father at war. 60% of military spouses say their children had increased levels of fear and anxiety when their husbands/wives went to war. 57% reported increased behavioral problems at home. 36% cited increased behavioral problems at school. A year after parents retuned from combat 30% of children exhibited clinical levels of anxiety-levels requiring possible treatment. The children’s average age was eight. Copyright © 2019 Invictus Foundation. All rights reserved. Developed by All Pro Webworks, LLC.